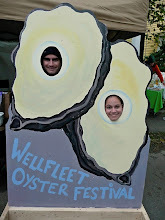 Go Shuck An Oyster: Massachusetts Oyster Project - Let them flourish! Massachusetts Oyster Project - Let them flourish! Oysters are more than just something something tasty to shuck and eat. Who knew? The Massachusetts Oyster Project is working to "return Massachusetts marine estuaries to their historic natures through the re-introduction of once native oysters. Through the placement, we can improve water quality, as well as attract other sealife including crabs, eelgrass, shrimp bluefish and striped bass." For more information about the Mass Oyster Project, click here. To learn more about the environmental benefits of oysters, click here. Check back soon for more on the Mass Oyster Project. During April and May I will provide updates on how their oysters are doing.